Besides items like aircraft, cotton, beef and orange juice, Beijing targeted American soybeans, whose producers count on China for more than half of their total foreign sales. In 2016, China purchased $14 billion worth of U.S. soybeans, many produced in states Trump won…. 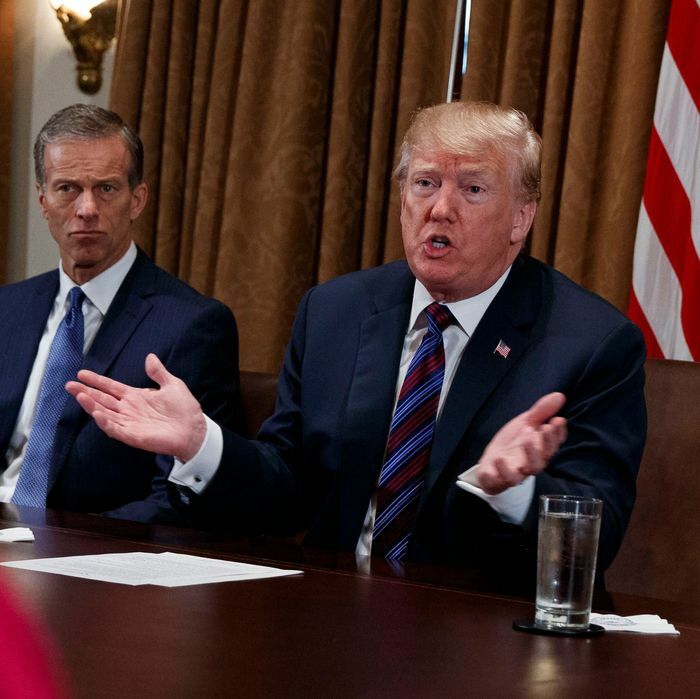 President Trump floated the idea of subsidy payments for farmers in a meeting today with Republican lawmakers, but nobody voiced support, according to two sources familiar with the meeting…. “The president was surprised by that. He’s like, ‘really?’ He said, ‘Oh really? Ok, so we won’t do that,’” Daines said. Like a lot of things involving this president, it’s not quite clear what was going on here. Was Trump not aware that there is a relatively large system of agriculture subsidies (valued at over $20 billion per year, not counting the costs passed on to consumers by production controls that boost prices)? Was he aware that probably everyone in the room who protested the idea of “welfare” for farmers supports these subsidies? Did he just not understand the code whereby farm-state folk defend subsidies as a hand-up rather than a hand-out? I have to say, if I were one of those abrasive conservative ideologues who would like to scrap the entire federal farm program infrastructure, I’d find some way to remind Trump of this meeting when the next subsidy-engorged farm bill comes waddling toward his desk. Perhaps there was some staff follow-up to reassure the farm-state lawmakers know the discussion was something the president would soon forget, or that he didn’t take their rejection of a new trade-related subsidy as representing a sudden free-market epiphany. But you never know when this kind of exchange can leap back into the president’s mind and cause havoc.